When we talk of the historic rivalries in women’s wrestling, there are a certain few that spring to mind. From the pioneering battles between Mae Young and Mildred Burke in the 1950s all the way to Lita and Trish Stratus‘s rollercoaster rivalry at the turn of this century, there are plenty of classic feuds to choose from. 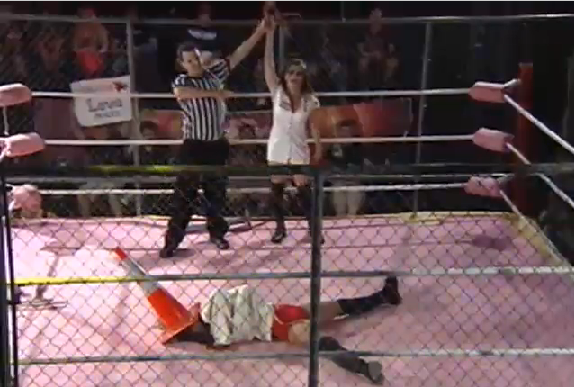 Now in 2013, it’s time to add another to the list, as Leva Bates and Kimberly‘s epic, seven-month long tale reached its tantalising denouement in violent fashion on Friday night inside an unforgiving steel cage. It all began at SHINE 3 in September when they faced off for the first time in singles action, with Leva picking up the win and piling on the misery for Kimberly, who was on quite the losing streak at the time. An unsuccessful attempt at teaming up together to take on Made in Sin at SHINE 5 was the final straw for Kimberly, who snapped, lashing out viciously on Leva. Three SHINEs and three matches later, including a Last Woman Standing match and a gruesome Fans Bring Weapons/I Quit match, the scores were levelled at 2-2, with no sign of closure. Thus, the stage was set for the final stand. Leva and Kimberly would battle it out inside a steel cage to decide the outcome of their feud once and for all. What’s more, at the beginning of the show a secondary stipulation was announced – the winner would have to put their opponent in a straitjacket to end the match. The match was an intense, unrelenting affair, with both women using the cage as a weapon several times alongside various other objects. After a brutal missile dropkick to Kimberly from the top of the cage, Leva took control of the match, and despite Kimberly’s resilience (and quite an awkward, lengthy struggle which didn’t do the match any favours) was able to strap the straitjacket in to get the victory and bring one of the most thrilling rivalries in modern women’s wrestling to a close. A great end to an incredible feud which built itself up and up and always kept us desperate to know what was going to happen next – credit to Leva and Kimberly for the magnificent story they’ve told over the past several months. From one historic moment to another, SHINE 9 also saw the opening qualifying matches of the SHINE Championship Tournament, which will crown the first ever SHINE champion. Four matches took place, with a further four to take place at the next show. In the first qualifying match, Su Yung was given the biggest challenge of her career to date, drawn against the recently-dethroned and extremely angry former SHIMMER Champion Saraya Knight. Knight was unimpressed by her opponent, showing her no respect, but Yung was quick to make her pay for her arrogance, bringing the match to Saraya and almost getting a submission victory with her Yellow Fever hold a number of times. In the end, however, Saraya’s sheer aggression was too much for Su to take, picking up the win with a powerbomb and advancing to the main tournament. The next qualifier saw Valkyrie leader Rain take on Angelina Love in a clash of veterans. Rain was joined by April Hunter at ringside, who made her presence known early on, attacking Love whenever the referee’s back was turned. Despite a strong effort from the 5-time Knockouts Champion Love, the numbers game was simply too much for her, with Rain hitting her patented implant DDT for the victory. Rain was, however, the only Valkyrie member to make it through in this batch of qualifiers, as Ivelisse came up short in her match against the returning Jazz. The match was a stiff, hard-hitting bout, with both making use of their considerable submission arsenals. Eventually, despite interference from Rain, Jazz was able to hit Ivelisse with the Jazz Stinger and make sure her return to SHINE was a victorious one, while giving Valkyrie their first defeat since forming back at SHINE 6. The final qualifying match was a never-before-seen dream match-up between two of the biggest stars in independent women’s wrestling today, Jessicka Havok and Madison Eagles, making her debut for SHINE after spending well over a year injured on the sidelines. For fourteen minutes they decimated each other, taking the match inside and outside the ring, and with more stiff kicks and reversals than you could count, before Havok finally got the breakthrough, reversing Eagles’ Hellbound attempt into an Air Raid Crash to advance to the next round as one of the surefire favourites to win the whole thing. A magnificent match that more than lived up to its already lofty expectations. Elsewhere on the card, we saw the youthful New Zealander Evie make her first appearance for SHINE against Mercedes Martinez in a losing effort despite giving Martinez a serious run for her money. It was a fine performance from the young Kiwi, and I have no doubt we’ll be seeing her again in a SHINE ring soon. Her fellow Antipodeans, the Australian trio of Kellie Skater, Jessie McKay and Shazza McKenzie, had a tad more success, defeating their American opposite numbers Nikki Roxx, Santana and Mia Yim in fun and fast-paced six-woman tag action. The international invasion continued with Irishwoman Rhia O’Reilly picking up the victory in a three-way match against Brittney Savage and the debuting Solo Darling, who made a real impression on the SHINE audience with a fantastic showing on her first outing for the company. Finally, Valkyrie and Made in Sin member Allysin Kay garnered a win in contentious fashion over Courtney Rush, who had Kay tapping while the referee’s back was turned (thanks once again to April Hunter) only for Kay to sneak up on the angered Rush with a Saito suplex for the three-count. Also, in the intermission Nikki Roxx’s birthday celebrations were rudely interrupted by Merecedes Martinez, with whom Roxx has developed somewhat of a competitive rivalry over recent SHINE shows. Martinez threw pieces of Roxx’s birthday cake into her face, which can only signify that this feud is far from over with – not a bad thing at all, both are excellent, well-travelled ring veterans and with Leva and Kimberly’s story finally put to rest this is the perfect high-profile rivalry to replace it! SHINE 9 marks a milestone in the company’s history in a number of ways. As well as it being the most consistent SHINE show to date (not a single bad, or even below-par match) the culmination of Leva and Kimberly’s epic feud and the beginning of the championship tournament shows that the company is ready to look to the future. The show wasn’t completely without its flaws – although when the only real gripe I have with the show is that it finished at 5:30 in the morning over here in the UK I don’t really have much to complain about. The introduction of the title is certainly an intriguing one, and the internet is already rife with speculation as to whom the inaugural champion will be, while Ivelisse’s defeat ending Valkyrie’s spell dominance will undoubtedly have some repercussions in the coming shows. All in all, a fantastic night of wrestling. Roll on SHINE 10!